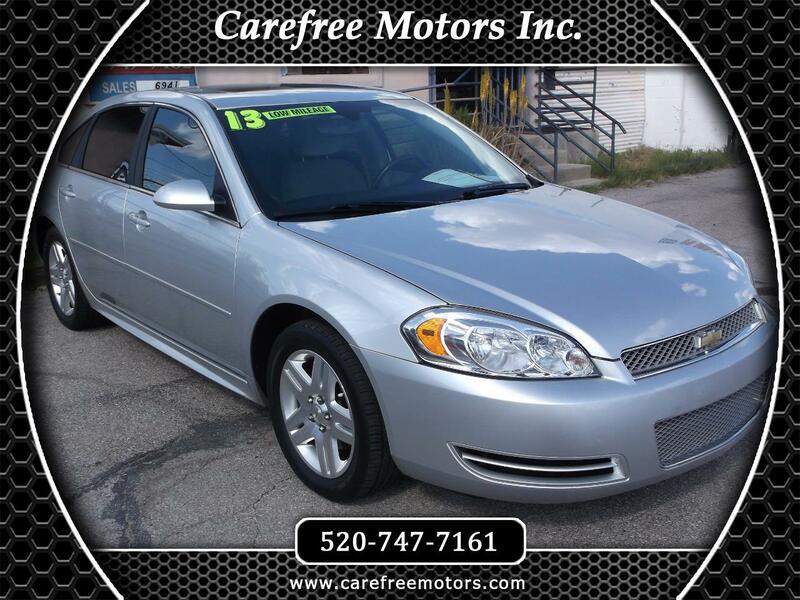 Used 2013 Chevrolet Impala LT (Fleet) for Sale in Tucson AZ 85710 Carefree Motors Inc.
PICTURE LOOKS BLUE BUT IT IS SILVER . GORGEOUS! 2013 Chevrolet Impala LT, 4 Door Sedan, V6, 3.6 Liter, Automatic, 6-Spd Overdrive, Front Wheel Drive, Touring Suspension, Traction Control, StabiliTrak, ABS (4-Wheel), Keyless Entry, Keyless Start, Air Conditioning, Moon Roof, Power Windows, Power Door Locks, Cruise Control, Power Steering, Tilt Wheel, AM/FM Stereo, CD/MP3 (SingleDisc), Blue Tooth Wireless, OnStar, Dual Air Bags, Side Air Bags, F&R Head Curtain Air Bags, Power Seat, Daytime Running Lights, Alloy Wheels, 60,982 Original Actual Miles! 2 YEAR FREE LUBE LIL AND FILTER Changes!